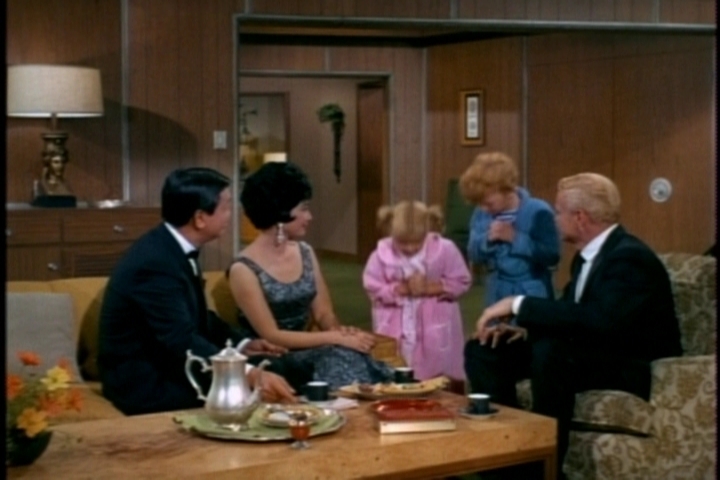 Uncle Bill is entertaining some friends, the Changs, when Buffy and Jody enter the living room to say good night. Mrs. Chang offers to tuck Buffy and Jody into bed. Tommy and Susie are 20 and 15, and Mrs. Chang misses having young children. 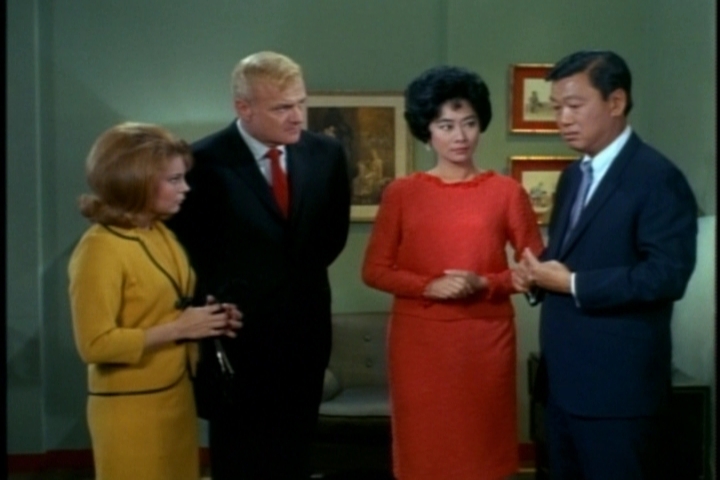 Mrs. Chang tells Buffy and Jody a lovely story about the Land of…Fusang? (That’s the best I can come up with based on the pronunciation and my Googling. Someone please correct me on this or any other Chinese reference that I get wrong.) In this land, every day is a holiday, falls don’t result in skinned knees, all girls are pretty, and all boys are strong. When it rains, it rains lemonade, and it snows strawberry, chocolate, and peppermint stick ice cream. 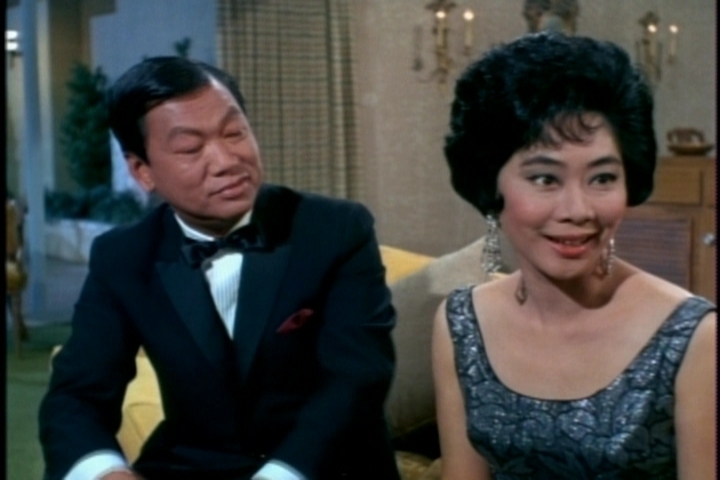 May I pause here to say that I love, love, love Mrs. Chang’s gown? 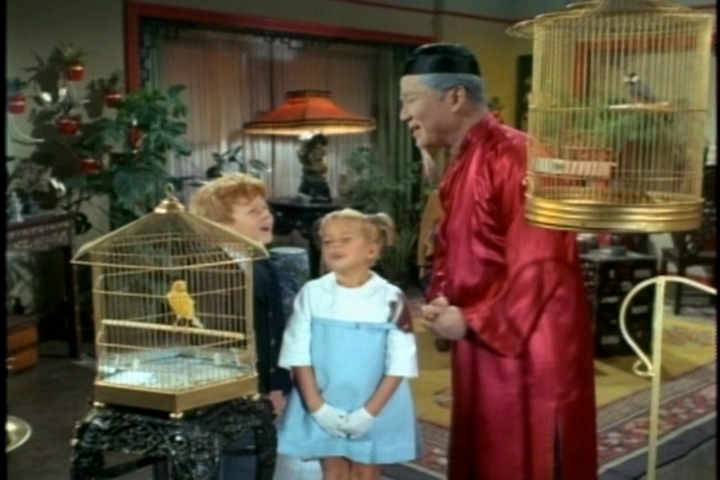 As the Changs prepare to leave, Mr. Chang invites the Davis family to spend Chinese New Year at their home. Mr. Chang thinks hosting company will do his father some good. When the Davises arrive at the Chang’s house, they learn that Tommy and Susie are attending a basketball game and won’t be joining in the celebration. 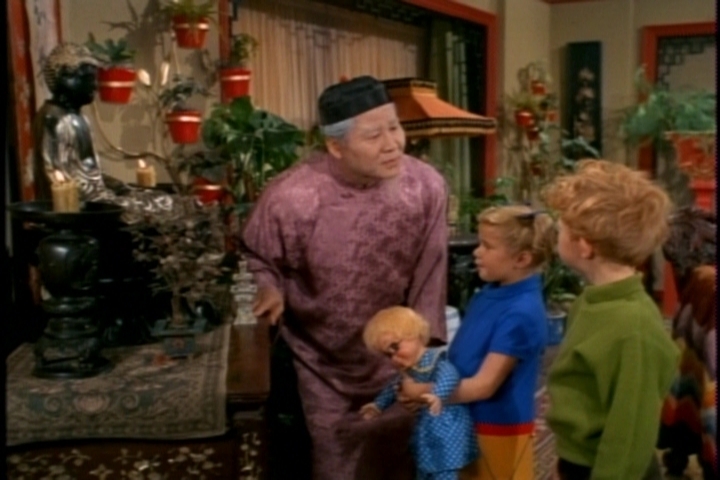 They also meet Liang, who seems to be the Chang version of Mr. French. As we’ll find out later, she’s more like the Chang version of Aunt Fran. Cissy’s discomfort during this depressing conversation amuses me. She’s probably wishing she was at the basketball game with Tommy and Susie. Meanwhile, Grandfather is in the other room, showing Buffy and Jody his bird. He tells them that birds are good company for someone as “old and useless” as himself. The kids find Grandfather anything but useless, however. Actually, Grandfather looks like someone dipped his head in a barrel of talcum powder to “age” him. 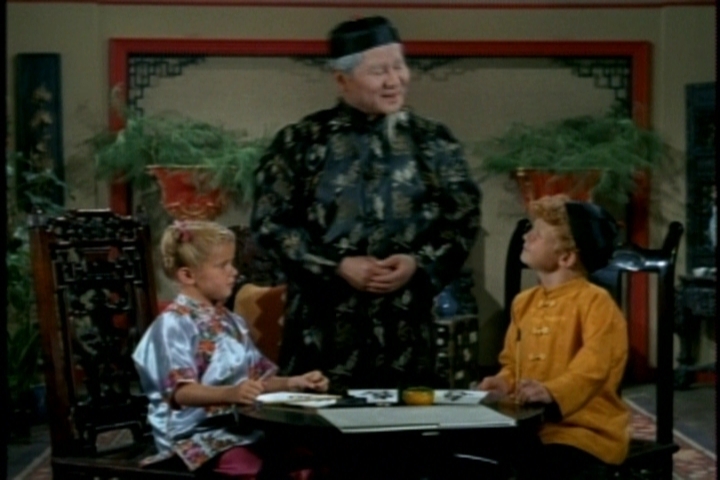 I suppose that’s because Keye Luke was only 12 years older than the actor playing his son. Grandfather and the twins hit it off so well that, the next day, Mr. Chang arrives at the Davis apartment bearing a gift. Oh, boy. A bird. Uncle Bill can hardly contain his delight. 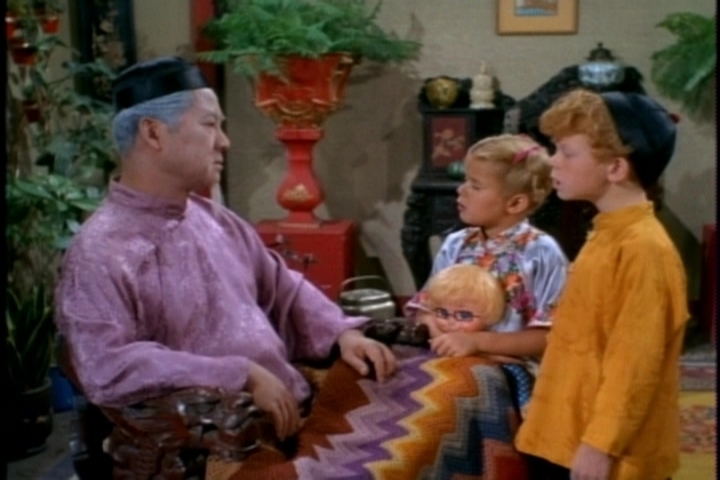 Mr. Chang says his father has had a new sparkle in his eye since he met the twins, and he requests that they visit again. In the episode’s funniest scene, French reacts to the “feathered creature” that Buffy and Jody have re-gifted to him. Since Grandfather said birds are excellent company for lonely people, the twins thought Mr. French should have their feathered friend! 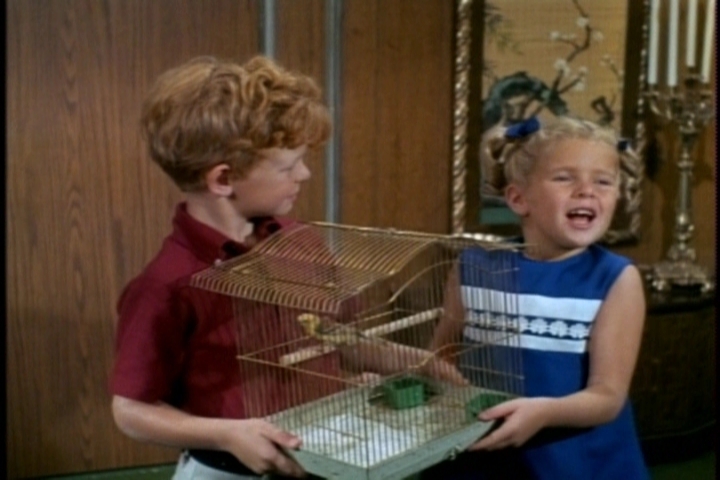 When the twins visit Grandfather again, Buffy brings Mrs. Beasley with her. Grandfather calls the doll “most beautiful lady” and Buffy makes her bow–cute! He tells them a story about his own childhood. His grandfather also kept birds, and together they would carry the cages out into the woods. The would hang the cages in the trees, and his grandfather’s friends would join them and do the same with their bird cages. “The trees were filled with singing birds,” Grandfather remembers. The twins tell him that they have no grandparents. “Will you be our grandfather?” they ask. Touched, Grandfather shows the kids his ancestor shrine and welcomes them into his family. At home, the kids’ enthusiasm for Chinese culture affects everyone. French has even taken to greeting people with a bow. The kids are wearing adorable Chinese clothing, and French is using a gong to call everyone to dinner. Both the clothing and the gong are gifts from Grandfather Chang. “It’s like living in an old Charlie Chan movie!” Cissy complains. Wow, Cissy is culturally insensitive. She’s also more right than she knows–see the Guest Cast section. Grandfather is even teaching the twins to write Chinese characters, though the kids are somewhat daunted when they learn that there are more than 50,000 of them. Buffy has a secret weapon, though–her tongue. She says sticking it out helps her steady her hand. Jody tries it and finds it helps him, too. Everyone is just as happy as happy can be. Well, almost everybody. “Today’s wisdom spawns tomorrow’s despair,” Liang announces cheerfully. 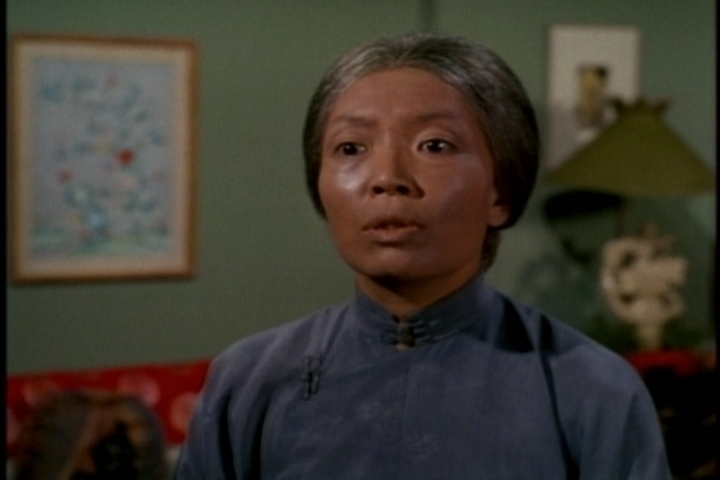 Random observation: Liang, who’s been rocking the talcum powder look like Grandfather throughout the episode, apparently dipped her head in a barrel of pancake makeup before this scene. Grandfather confronts Liang, who tells him that the twins’ attention to him has been a “cruel trick.” Believing her, he slips back into his funk. 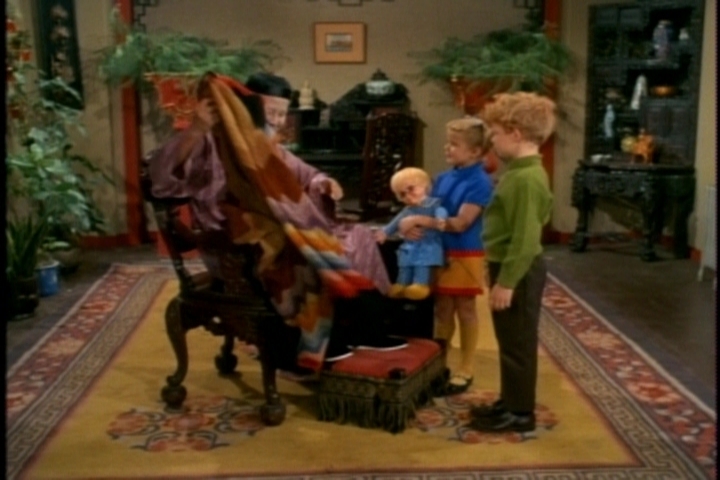 Mr. Chang tells Bill about this turn of events, and Bill hustles the twins off to see Grandfather. “We’re not playing a game–we missed you,” the kids tell Grandfather. They talk about how they want to bring their friends over to meet him. “Now, when they talk about their grandfathers, we don’t have to just listen,” they say. Awww. Grandfather is touched, and all is well again. Soon, Grandfather and the kids are heading to Central Park for a good, old-fashioned bird hanging. Even French gets dragged along–though he admits that he dreads telling his friends that he’s out walking his bird. Everyone has a good laugh, unaware that French’s bird will disappear before the next episode. I’m guessing that French put the cage on the terrace and “accidentally” left the door open. Once again, Family Affair explores one of the cultures in New York’s melting pot. Though the show over-relies on stereotypes at times, its heart is clearly in the right place. 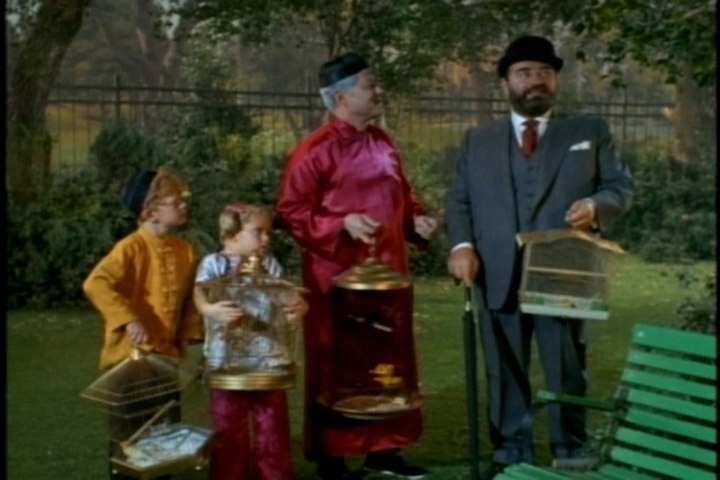 This episode is sweet, and it makes sense that orphaned children and a lonely old man could forge a strong bond. Only one person fails to cover himself with glory during this episode. That’s right Stanley J. Smith–I’m looking at you! 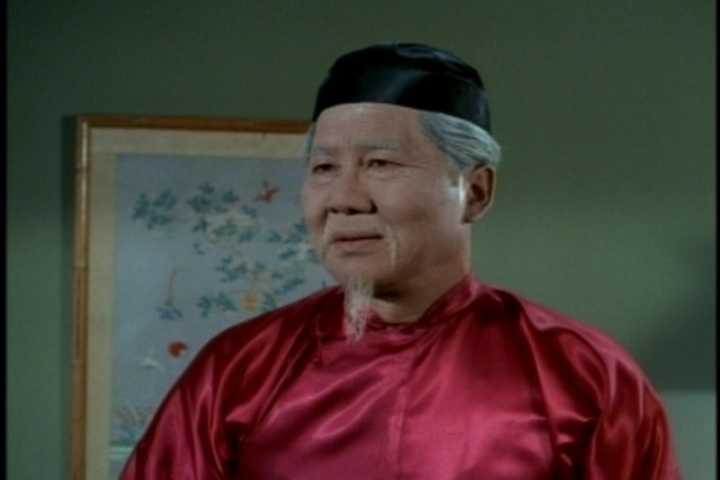 Grandfather Chang: Keye Luke. Paul Chang: Benson Fong. Betty Chang: Lisa Lu. Liang: Beulah Quo. Luke was a major Chinese-American actor. He first came to prominence playing “Number One Son” Lee Chan in the 1930s Charlie Chan films. and had small parts in dozens of movies right up until his death in 1991. (His last role was in Woody Allen’s Alice.) 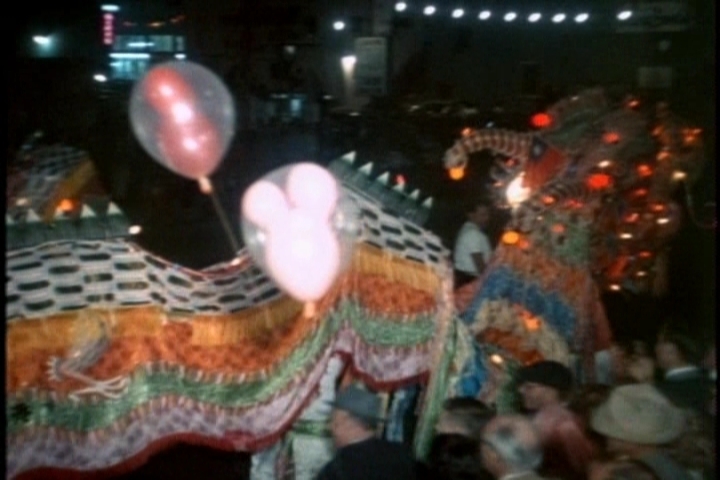 On Broadway, he appeared in Flower Drum Song. He voiced Charlie Chan in the 1970s cartoon The Amazing Chan and the Chan Clan. 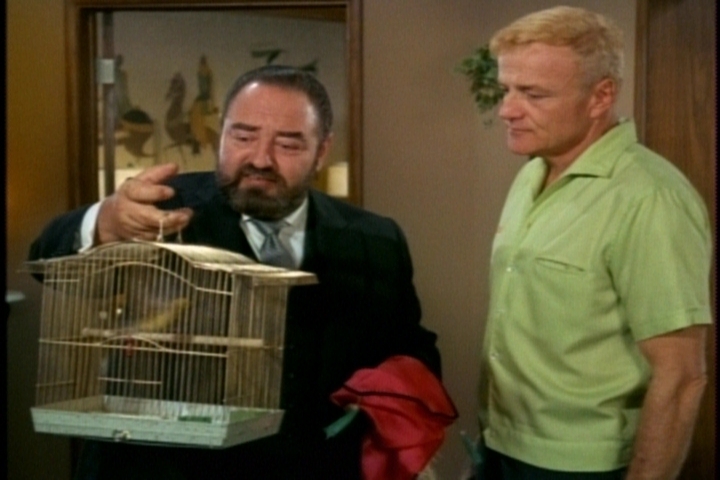 He was Master Po in the TV series Kung Fu and made frequent guest appearances on M*A*S*H. He was also an accomplished artist; it was while working as a commercial artist that he first came to the attention of movie studios. Benson Fong’s career parallel’s Luke’s in many ways. 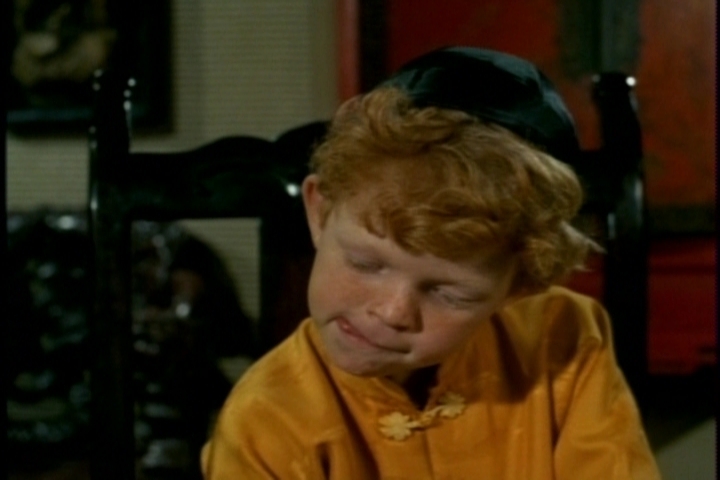 He played “Number Three Son” in several 1940s Charlie Chan films. (A fun review of one of these recently appeared at Silver Screenings.) 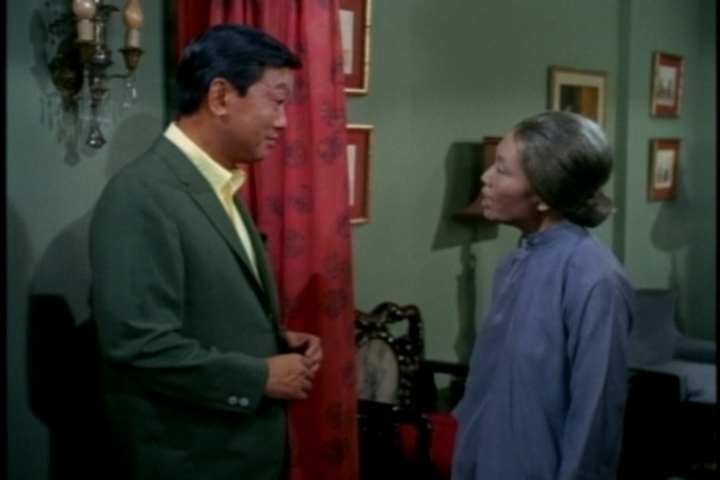 He had a role in the movie version of Flower Drum Song and appeared in several episodes of Kung Fu. 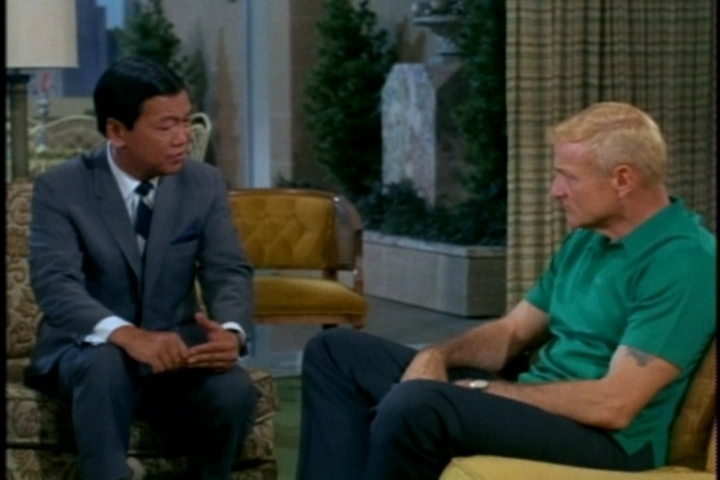 Family Affair creator Don Fedderson must have liked him because Fong had a recurring role as Ray Wong in Fedderson’s other show, My Three Sons. 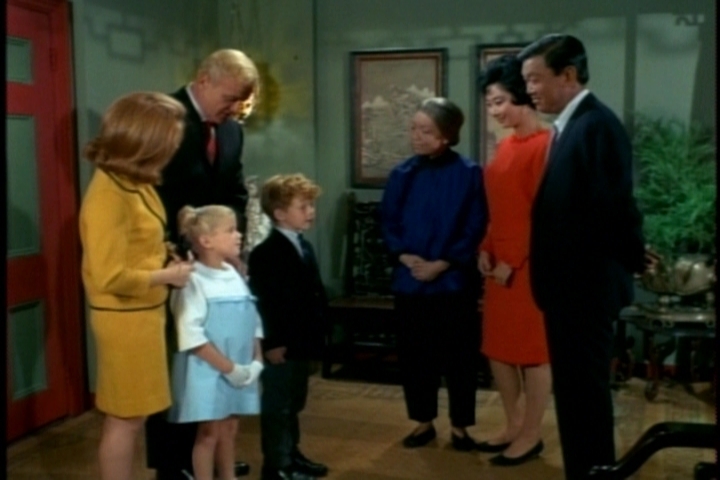 He would appear in two more episodes of Family Affair, and two of his children also played guest roles on the show–daughter Lisa in Episode 1.23 and son Brian in season five. Benson Fong was also a successful restauranteur. He died in 1987. Lisa Lu had a recurring role in the TV series Have Gun, Will Travel. 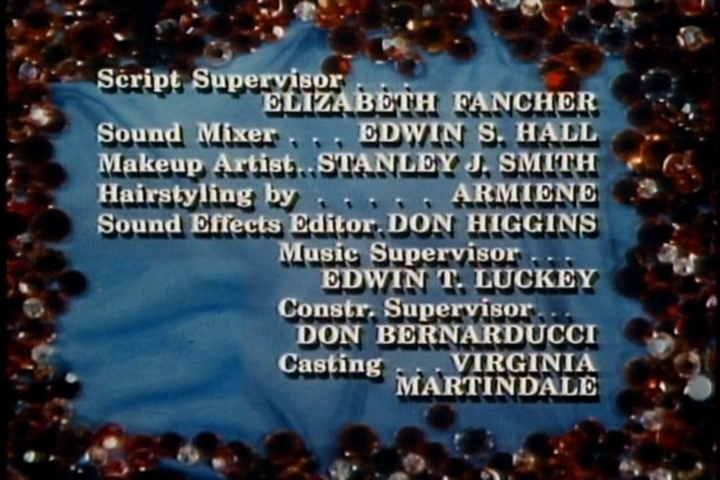 Most of her other roles have been small, but I’m happy to report that she’s still alive and working. Beulah Quo worked steadily in television until her death in 2002. 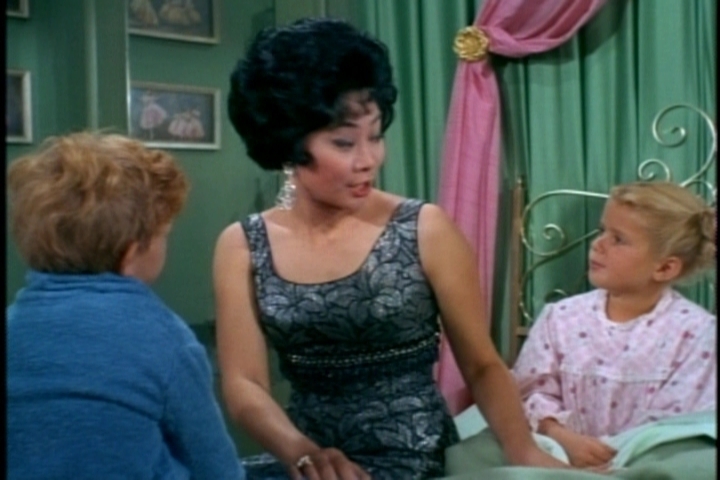 Like Fong, she had a recurring role on My Three Sons. 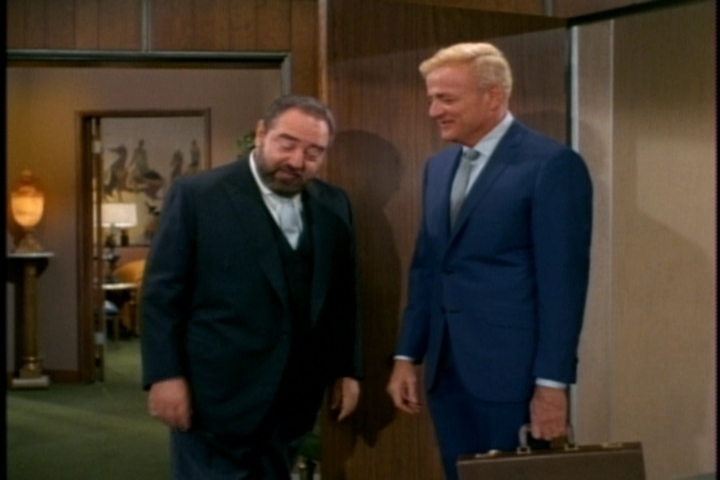 This entry was posted in Family Affair, Television and tagged 1960s, Anissa Jones, Brian Keith, Classic Television, Family Affair, Johnnie Whitaker, Johnny Whitaker, Kathy Garver, Keye Luke, Nostalgia, Sebastian Cabot, Television. I recognized Lisa Lu from The Joy Luck Club. She was one of the mothers. But she’s a lot younger here. Yes, that was probably one of her most visible roles. 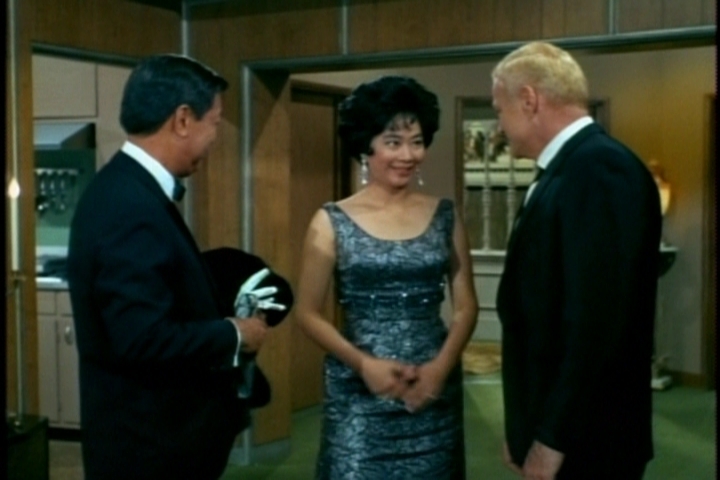 Loved the talcum powder observations, and I want Mrs Chang’s gown! It’s stunning. It is a sweet episode, and I think I would rank it among my favorites. 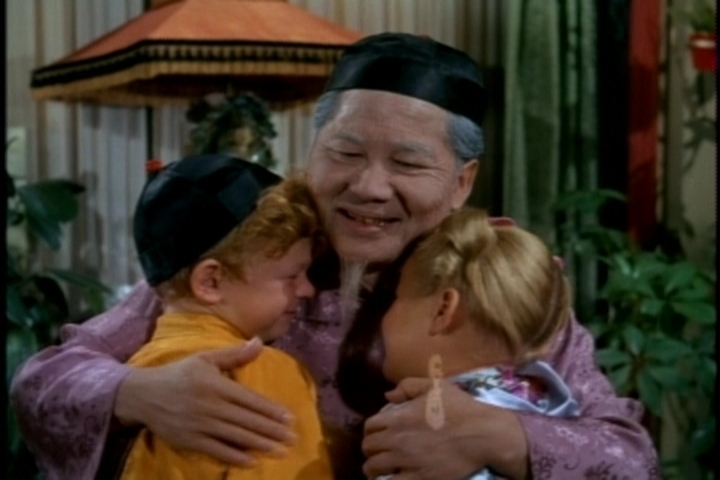 Keye Luke gives a nice, understated performance as Grandfather. Good old Swissy Mouse balloons. Disney did battle with them for years over copyright violation. Used to be sold at fairs and parades in the 1960s. I’m so glad you explained those balloons! They really perplexed me.